These are perceptive and beautifully informed performances of two wonderful works which make the perfect pairing. 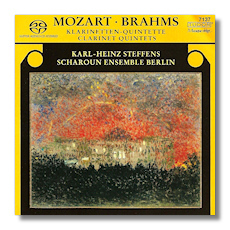 Already seasoned campaigners in such repertoire, the Scharoun Ensemble bring out the mystical romantic beauty of the Mozart in manners which almost recall the great Amadeus Quintet or the Vienna Octet but with the added benefit of stunning SACD sound. The rare haunting music of the Larghetto has never been so marvelously played, and I am sure that most listeners will agree with me. The Brahms is also played brilliantly with just the right ounce of charm balanced with wit and sentimentality to make this a reading to remember. Here, the Adagio is again the key to the work and the Scharoun Ensemble play with great passion and warmth. Yet again, the recording is pretty marvelous to listen to with the SACD sound particularly enticing. A winner through and through.